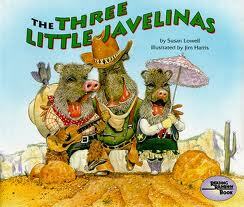 Recently I received a suggestion to read The Three Little Javelinas, so we checked it out. This hilarious retelling by Susan Lowell of “The Three Little Pigs” uses the southwestern wild pigs as the main characters and a coyote as their wolf-like counterpart. Instead of straw, sticks, and bricks, these animals build homes of tumbleweeds, cactus sticks, and adobe materials. My oldest daughter told me that she really liked that one of the javelinas was a girl. I think my favorite part of this story was hearing my husband read it to our children using a Tex-Mex accent! Pros: A very funny book that can be used to introduce children to animals and plants of a desert setting. Cons: You will probably have a belly ache from laughing so hard after reading this book. 1. “Excellence of execution in the artistic technique employed.” – Every other page is illustrated with vibrantly colorful, simple depictions of the story. The alternating pages are outlined with interesting, rust-colored block figures and drawings. 2. “Excellence of pictorial interpretation of story, theme, or concept.” – I appreciate that the illustrator chose to accurately picture the story, including the clothing and food. 3. “Appropriateness of style of illustration to the story, theme or concept.”- These pictures are stylistically appropriate for the era of the story. 4. “Delineation of plot, theme, characters, setting, mood or information through the pictures.” – All of these characteristics are clear through the pictures except for mood. From what I understand of Puritan culture, though, this lack of emotional display would have been typical. 5. “Excellence of presentation in recognition of a child audience.” – My children enjoyed this book and asked lots of questions about the story. I would recommend this book to remind families of the true reason for our nation’s Thanksgiving holiday. In reviewing a kindergarten reading list that I am following for my daughter I realized that we had not read any books on art. Not feeling confident in my knowledge of art appreciation, I decided I should try out the books suggested in that subject area. I Spy Colors in Art, devised and selected by Lucy Micklethwait, fabulously utilizes famous works of art from all eras in an “I Spy” game format to encourage children to become familiar with looking at art and noticing details within each picture. While most of the items to be found are easily spotted even by my children with visual impairments, some pictures were more complex. I really liked that there is only one item to look for on each page, allowing preschoolers to find the item and then move on rather than becoming bored from staring at the same page for too long a time. Pros: I Spy Colors in Art is an excellent preschool/early elementary book useful for introducing art appreciation, as well as for reinforcing color identification.e format to encourage children to become familiar with looking at art and noticing details within each picture. While most of the items to be found are easily spotted even by my children with visual impairments, some pictures were more complex. I really liked that there is only one item to look for on each page, allowing preschoolers to find the item and then move on rather than becoming bored from staring at the same page for too long a time. Do you love to run? Do you love shoes? Are you, like me, a Southern girl who believes no one should wear shoes until December? What Should I Put on My Feet to Go Run? 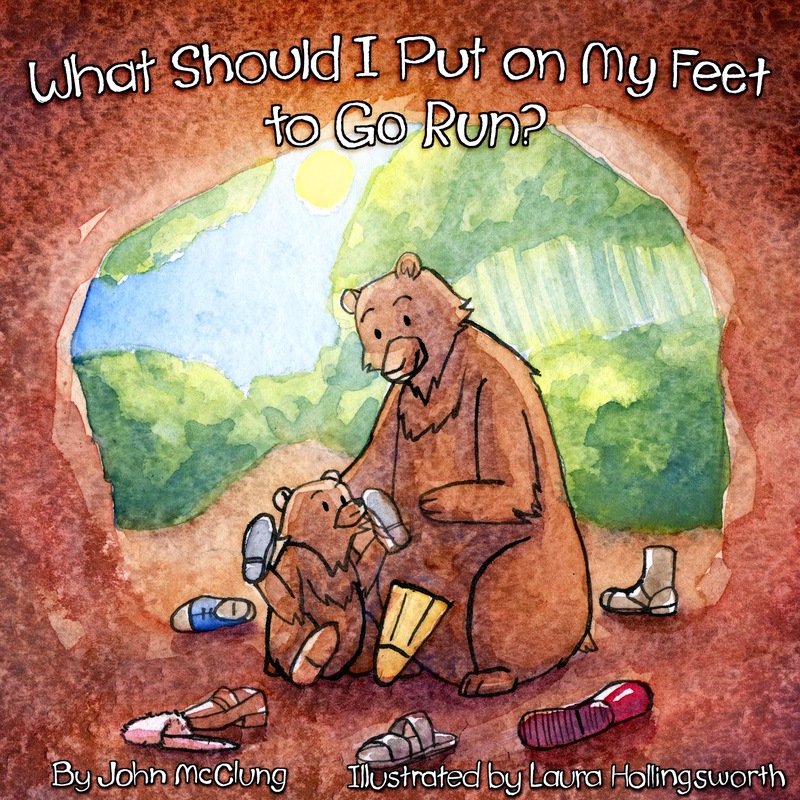 written by John McClung and illustrated by Laura Hollingsworth tells the story of a bear cub who awakens beside his mother in their cave and immediately wants to go out to play. When the little bear asks his mother about appropriate foot wear for the day he is told that he should go barefoot. He asks his mother about a myriad of shoe variations, but is still his mother reminds him that he does not need shoes. In the end they go outside together to play in their “barefoot bear feet.” Whether you want to encourage your children to exercise or love an adorable story about cute bears, this is a great book for you. Available for purchase this week on both Kindle (http://www.amazon.com/dp/B00A45ATEI) and in paperback (https://www.createspace.com/3946420.) Order a copy today and enjoy reading this new release to the children in your life! Also, check out the author’s blog at http://bfinaz.blogspot.com/.